Though less known for his keyboard music than his colleagues Scarlatti and Bach, Handel was an impressive keyboard player whose contemporaries noted his "uncommon brilliancy and command of finger." And while Handel's Eight Suites may be his most famous harpsichord music, he wrote tons of other suites plus separate fugues, preludes, dances, lessons, and chaconnes. 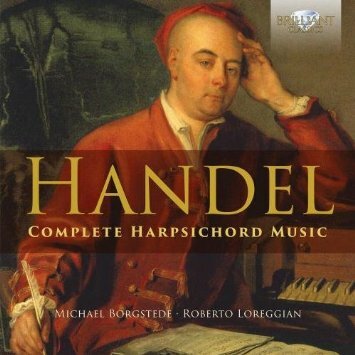 On this 8 CD set of previously-released performances, Michael Borgstede and Roberto Loreggian, with some help from Elisa Franchini, perform Handel's complete harpsichord works on four different instruments. Borgstede plays with a more feline, intimate touch, while Loreggian opts for a more extrovert tack; no problem, both obviously have authentic affection for the music. Borgstede's excellent liner notes include the admission that, "One work, however, the second Chaconne in G Major (HWV422) with its 62 Variations, is so monotonously simple that not even my desire for completeness could justify my including it here." Borgstede did include an obscurity called "Vo' Far Guerra," a transcription of a battle aria from Handel's opera Rinaldo, which "might be, for the most part, a notation of a harpsichord solo actually improvised by Handel himself during an opera performance." Just think, Handel noodling away. 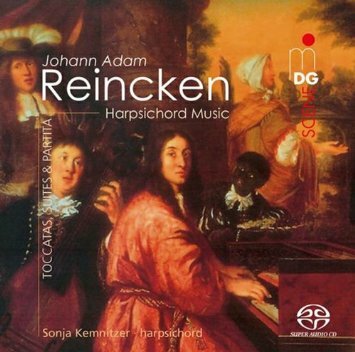 When Bach was sixteen and still in secondary school in Lüneburg, he walked 30 miles to Hamburg to hear an undisputed master of improvisational artistry named Johann Adam Reincken play. (It became a habit: Four years later, Bach walked 250 miles to hear Buxtehude play in Lüebeck.) The die was cast, or at least strongly influenced; Bach follows Reincken's powerful, ingenious and very human models in his own toccatas, even quoting motivic material from Reincken's works. The discs's highlight is Reincken's 24-minute long Partite diverse sopra l'Aria: "Schweiget mir von Weiber nehmen," 18 variations on a popular song about love and marriage, ending up in a suite of dance - allemande, courante, sarabande and gigue - that seems to shrug its shoulders at life's little eccentricities and just enjoy it without thinking too much. The music is given great currency by Sonja Kemnitzer, a soloist, educator (she teaches at the Conservatories of Frankfurt and Detmold) and multimedia producer (together with dancers, Kemnitzer has developed interdisciplinary projects like Tombeau-Totentanz, a scary-sounding amalgam of the musical splendors of Louis XIV's court and Franz Liszt's visions of hell). She may prefer foursquare certainty to the momentary impulse, but overall she captures Reincken's resplendent sense of beauty and compelling narrative flow, playing on a lovely, richly-toned harpsichord constructed after a Johannnes Ruckers original (1624) by Lutz Werum (1998). 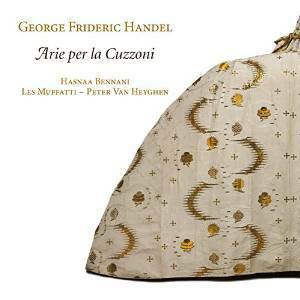 As we fondly bid adieu to Bach trudging around his northern German neighborhood, we return to Handel at his extrovert best on a CD that compiles music made famous by one of his most celebrated and most notorious prima donnas, Francesca Cuzzoni. It was about La Cuzzoni the incomparable singer, and not the scandalous diva, that Quantz wrote, "La Cuzzoni had a very pleasant and bright soprano voice, pure intonation and a beautiful trill. Her style of singing was artless and touching. Because of the dainty, pleasant and fluent way she performed them, her embellishments did not appear artificial; yet so tenderly did she sing them that she captured all listeners." La Cuzzoni's fairy tale rise and dramatic fall - "of her last years, little is known, save that she returned to the continent where she lived a poverty-stricken existence, eking out a living, it is said, making buttons" - and more, is all in Peter Wollny's delicious liner notes, including the intelligence that during one of their most contentious altercations, Handel is reported to have said to his prima donna, 'I know that you are a she devil but I will have you know that I am Beelzebub,' and with that took her up by the waist and threatened, if she complained any more, to fling her out the window." In addition to the glorious singing of the French-moroccan soprano Hasnaa Bennani, the disc features the Brussels-based ensemble called Les Muffatti, named in honor of the key role in history played by Georg Muffat (1653-1704), who not only wrote an important body of instrumental and early orchestral music but wrote about how to play it. Accordingly, Les Muffatti's interpretations "constantly strive for mastery of the theatrical quality so characteristic of Baroque art forms, an ambition which goes far beyond delivering a mere accurate rendition of a score." Hear! Hear! 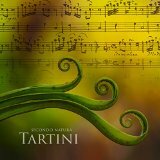 No doubt gearing up for 250th birthday celebrations in 2020, the flood of outstanding, important Tartini releases continues with this eerie, fantastical recording of the Devil's Trill Sonata surrounded by two endearing Sonatas from Op. 1 played by an ensemble that morphs at times into rough, lusty Norwegian folk fiddle style. Not surprisingly, it's just another curiously essential release on the Norwegian 2L label, a Scandinavian audiophile enterprise in the tradition of Harmonia Mundi France, lighting up candles for the birthday boy in advance with a recording for the ages haunted by musicological ghosts. Caveat: The recording comes only as stunningly beautiful Pure Audio Blu-ray disc, or as a download - either hi-fi, from Amazon (MP3) or hi-def, from HDtracks.com. Tartini would have loved it. This thoroughly goofy and deeply adorable enterprise is the brain child of an early music group called Ars Antiqua Austria, who performed a section of a picaresque musical concoction by a remote German composer named Georg Daniel Speer whose left home at 18, sets off through the Carpathian Mountains to present-day Slovakia, worked as a mercenary for various armies including bugling for the Hungarians in their war against the Turks, and reached Constantinople in the company of a high-born lord. 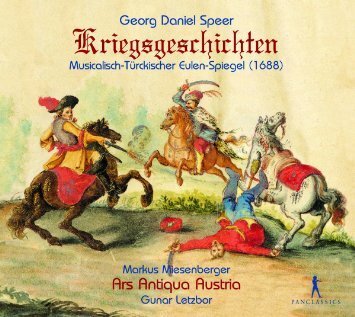 In Speer's Musicalisch-Türckischer Eulen-Spiegel, the musical adventurer set texts from his own novel in which his hero Lompyn hear music during his travels Speer himself might have heard, or more likely imagined, in some of the countries then affected by the Turkish invasion; this meant a delightful series of dances and songs in the styles of the Cossacks, Poles, Hungarians and Wallachians (the same Wallachians from Mozart's Così fan tutte). At the end, of course, the hero ponders the absurdity of war. In other words, a great lot of fun.